Bhuvneshwar Kumar is an Indian international cricketer. He plays for Uttar Pradesh in domestic cricket, and Sunrisers Hyderabad in the Indian Premier League. Bhuvneshwar Kumar is a right-arm fast-medium bowler who swings the ball both ways efficiently, especially adept at creating late swing, and a useful lower order right-handed batsman. He was first noticed in a T20 match against Pakistan, where he successfully took a three-wicket haul. He later proved to be a match winner for India. 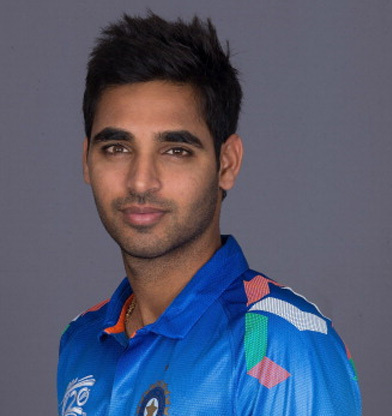 Bhuvneshwar Kumar was born in Meerut on 5 February 1990, He was born to Kiran Pal Singh who is a sub-inspector in UP Police and his wife is housemaker named Indresh Mavi . He belongs to village Luharli near Gulaothi in Bulandshahr. It was his sister Rekha Adhana, who encouraged him to play cricket and took him to his first coaching centre when he was 13. Bhuvneshwar Kumar is engaged to Nupur Nagar. He was rewarded for his consistent bowling when Sunrisers Hyderabad paid a whopping sum of 4.25 crores to avail his services. Bhuvneshwar Kumar played a pivotal role in winning them their maiden IPL trophy in 2016. He has a great 2017 season as well and is expected to double his signing amount in the future IPL player auctions. Bhuvneshwar Kumar plays for Uttar Pradesh in domestic cricket. He has also played for Central Zone in the Duleep Trophy. Kumar made his first-class debut at the age of 17 against Bengal. In the 2nd semi-final against North Zone, Bhuvneshwar Kumar took one wicket with an economy rate of 3.03. Although being a lower-order batsman, he scored 128 off 312 balls surpassing all the scores of his teammates and maintained a partnership with four batsmen. He was consequently awarded the Man of the match. In the 2008/09 Ranji Trophy final, he became the first bowler to dismiss Sachin Tendulkar, rated as India's greatest batsman, for a duck in first-class cricket.